While traveling through New England just two months ago, Linda and I made it a point to drop into any bookshop that looked interesting – our usual mode of operation. 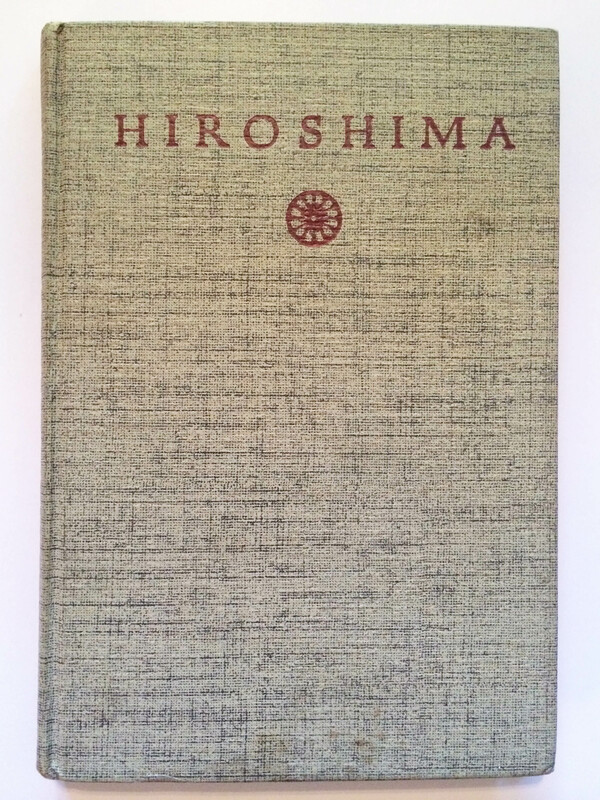 In the back room of a rustic little shop in Lenox, Massachusetts, I found a small, unassuming little volume titled simply, “Hiroshima.” Because of my interest in the science and history of nuclear weapons, I recognized the title as a possibly important one. It was published by John Hersey in 1946, the year after the atomic bombings of Hiroshima and Nagasaki. There is a bookplate on the inside cover, and the book’s fine condition suggests it had been cared for over the years. Hersey’s piece, an expose of the horrors of nuclear weaponry, was first published in the “New Yorker” magazine. My little book is an obvious first book edition. Today’s “Wall Street Journal” Bookshelf (Aug. 6, 2014) under its byline, “A Decision and It’s Fallout,” reviews a new book by Paul Ham titled, “Hiroshima Nagasaki.” The book review mentions Hersey’s book as the best representative of the first wave of moral revulsion over the decision to use atomic bombs on Japan. Indeed, Hersey’s accounts of specific bombing victims and the general aftermath in Hiroshima paint a stark and gloomy picture. With the specter of nuclear weapons ever-lurking in the shadows, the warfare currently raging on several world stages along with these specific recent reminders of Hiroshima prompted me to write this blog-post. What does that mean? In nuclear weapons parlance, “going critical” refers to the condition whereby enough radioactive material is effectively combined to enable a nuclear “chain reaction.” A chain reaction occurs during the “fission” process whereby atoms are split apart releasing both energy and enough free neutrons which act as new “bullets” to split yet other neighboring atoms in a rapidly cascading scenario. When the state of criticality is met, runaway fission occurs, accompanied by a tremendous, almost instantaneous release of nuclear energy in accordance with Einstein’s most famous prediction that e = mc2. A nuclear chain reaction can be controlled and sustained in a lab environment without catastrophic results as demonstrated by Enrico Fermi and his team of physicists. They were an advanced “arm” of the Manhattan Project, the government’s crash program in World War Two to build the first atomic bomb. Fermi and his team demonstrated the feasibility of a nuclear chain reaction on Dec.2, 1942 while working under the old football bleachers at the University of Chicago’s Stagg Field. In contrast with Fermi’s ability to moderate his chain reaction, in a nuclear weapon once criticality is reached in the bomb’s radioactive core, the reaction is unstoppable and virtually instantaneous. There is no going back. It is that statement which frightens me about the state of world affairs, today. Are we, the societies which comprise our earthly civilization, approaching a point of criticality in our global relationships, and, given our powers of mutual mass destruction, risking a point of no return? Is a flash-point possible which triggers a chain reaction of events from which there is no turning back? I fear that is so. -When any country announces that it will do whatever it needs to do to protect its people, that is precisely what its citizens expect. But how far does that policy extend, and at what point are a country’s citizens deemed to be in mortal danger to the point where all options should be on the table? -What would happen to any state or region of the globe deemed “responsible” if even a crude nuclear device were detonated in or over the financial center of New York City? While at this time, only Russia and China have nuclear arsenals large enough to truly destroy the United States in a physical sense, the damage inflicted by a single, small nuclear strike on New York City to this country’s economy and our way of life, would constitute a “virtual destruction” of the country as we know it. The retaliatory price to be paid would, almost certainly, be massive for the actual or perhaps even for a “perceived” perpetrator. And then what follows? 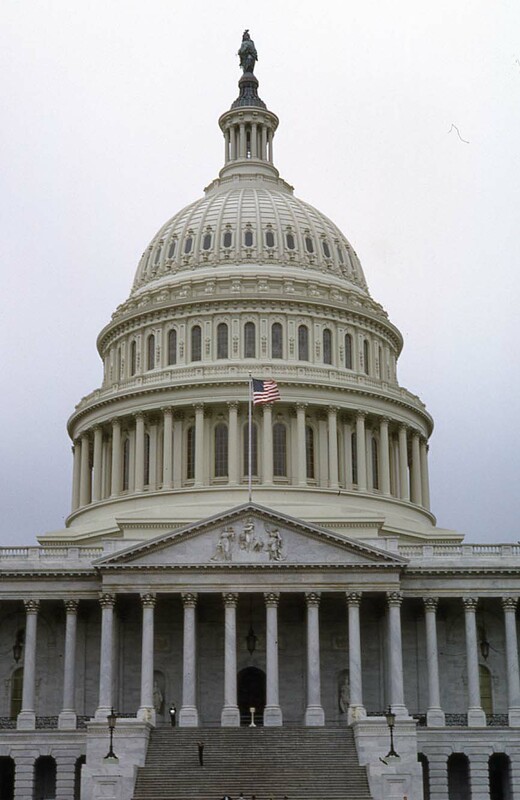 -What about an unintentional or unwarranted nuclear first-strike? Never say “impossible” – extremely unlikely, yes, but once nuclear-tipped missiles are launched, they cannot be called back – a necessary “precaution,” if you will. One thing is certain: The brilliance of the scientific/engineering community in decoding the laws of physics and fabricating such powerful weapons will never be matched by a similar competence and capability of the bureaucrats who control them. Perhaps you have heard the news of our recent missile silo problems in that regard. -And finally: At what point will the common framework of “humanity” supersede the more secondary distinctions which so prevail today – nationality, race/ethnicity, religion, tribal allegiances, etc.? Increasingly, the evidence says no. Look at the recent reports of massive cyber-theft. Do you recall the live smallpox virus recently found in a cardboard box at some abandoned health facility? By long-standing international agreement, there are only two designated sites on the planet which are authorized to possess live smallpox… under lock-and-key: Russia and here, in the United States. These two examples illustrate the overriding fact that a chain is only as strong as its weakest link – a truism that will always haunt our efforts to manage technology. There will always be weak links and vulnerabilities! On a more benign level, many of today’s roads cannot handle the ridiculous commute traffic we have created, a legacy of that truly wonderful engineering triumph, the automobile. Say, wasn’t the automobile supposed to free us from our shackles? The real question is, of course: What policies will govern the possible use or non-use of acquired nuclear weapons? Implicit in any such discussion is the whole concept of “civilian casualties” in warfare, a topic so often pertinent to the conflicts we hear reported every day. There seem to be no satisfactory answers to that issue and to the even larger questions – and that is very troubling. As the “Wall Street Journal” book review reported, “Dutch” Van Kirk, the last surviving crew member of the B-29, “Enola Gay,” which bombed Hiroshima, died last month. His view of modern warfare discounted any application of moral logic: “It’s really hard to talk about morality and war in the same sentence.” As General William T. Sherman so aptly stated and demonstrated in Georgia during the U.S. Civil War, “War is hell,” and there is no other way around it. The world had better think long and hard about that reality, for the potential stakes today are immense, and there is no room or time for second-thoughts. Two years ago, Linda and I toured Hyde Park on the Hudson in upper New York. We found it fascinating, and the more we learn about Franklin Roosevelt, the man and the politician, the more we want to know. As our little tour group assembled in front of the venerable old mansion which was Roosevelt’s family home for generations, our middle-aged tour guide with a back-east accent said something unusual, something which certainly struck a chord with me. “See that door over there at the right-corner of the house?” he asked. He went on to explain that is where Franklin Roosevelt and long-time friend and White House advisor, Harry Hopkins, made the most important decision of Roosevelt’s long career. In that little corner office, they set in motion the Manhattan Project, the full-out, no-expense-spared effort to develop the atomic bomb – before Germany could do it. The nuclear race was on. “A most unusual opening remark for a tour guide,” was my first reaction. My long interest in the Manhattan Project and all that it signifies, however, made me nod in agreement. Our guide had obviously studied his history and had similar viewpoints on that particular matter – very interesting! For readers who would like to know more about the Manhattan Project and the ramifications which stem from its success, I whole-heartedly recommend the documentary film by Jon Else, “The Day After Trinity.” It is the best of the many and varied fine documentaries I have in my video library. It is a film which everyone should watch, and one which no one who does watch will forget. It is not a film about bombs, or science, or merely history – it is first and foremost a human story, centered on J. Robert Oppenheimer, the brilliant principal architect of the bomb. The story, as related by many of the key players on the project, delivers a message for all humanity. 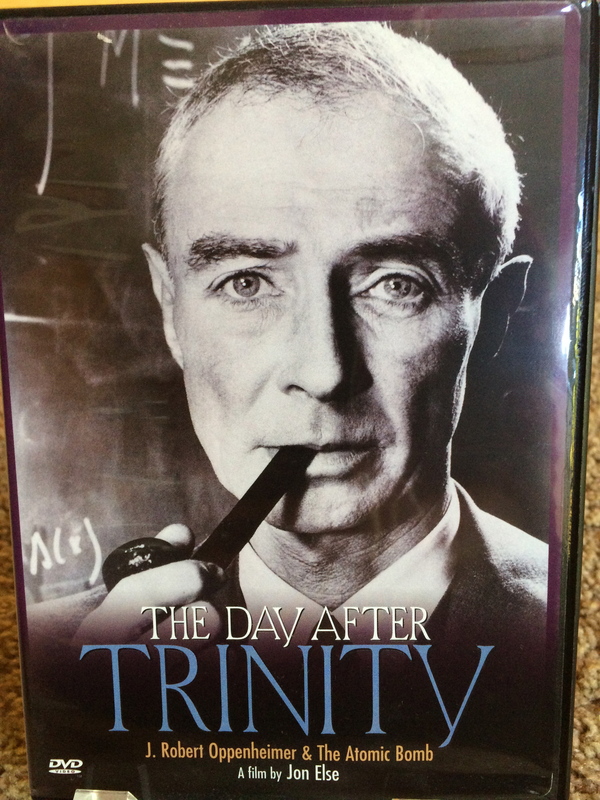 Oppenheimer’s eyes on the DVD cover convey a message about the truth he had quickly recognized: The nuclear genie is loose, and it is already too late to control it. Despite my enthusiastic testimonial for this film, I have no connection whatsoever with its sales or marketing. 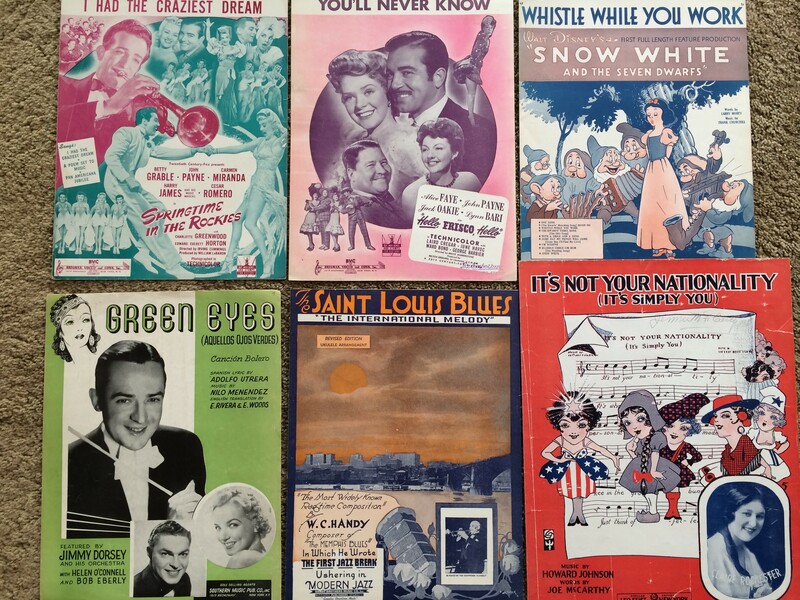 My mission here, as always, is to pass along something that I deem special to the readers of my blog. Yesterday was a gorgeous weather day, so we hit the road early and drove to the town of Pleasanton, California – some forty-five minutes away. 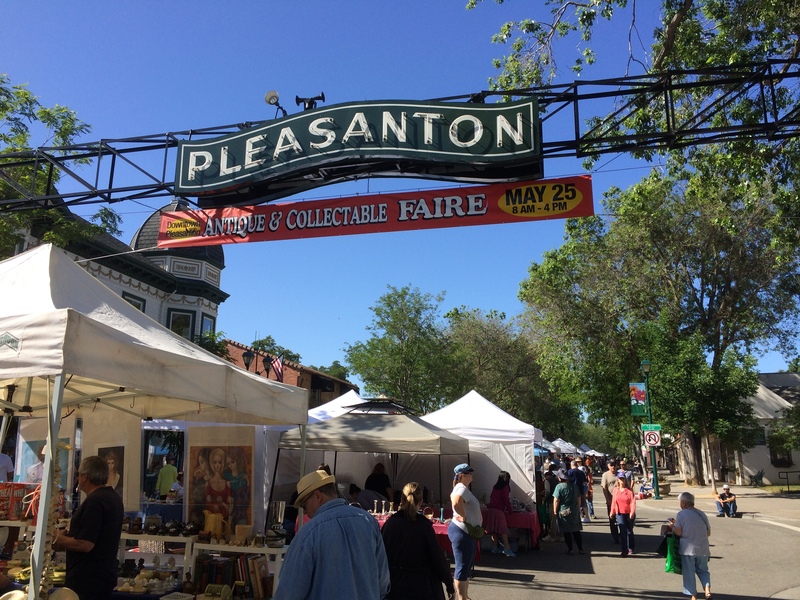 We wanted to arrive there early for two reasons: First, to get a good parking space, and second, to get an early look at the goodies available from the many sellers at the bi-annual, one-day Pleasanton Antique & Collectable Fair. The last and perhaps my only truly great find in antique stores and at fairs was the excellent 1934 Ingersoll Mickey Mouse wristwatch which I purchased from a small antique shop in Fillmore, California, several years ago. Although it was not a steal, the price was very good, especially since the completely original, working watch was consigned by the local granddaughter of the man who originally purchased it at the Chicago World Fair of 1933. For more on that, see my post of September 8, 2013, A Rare Antique Shop Find: A 1934 Ingersoll Mickey Mouse Watch, available in my blog archive. 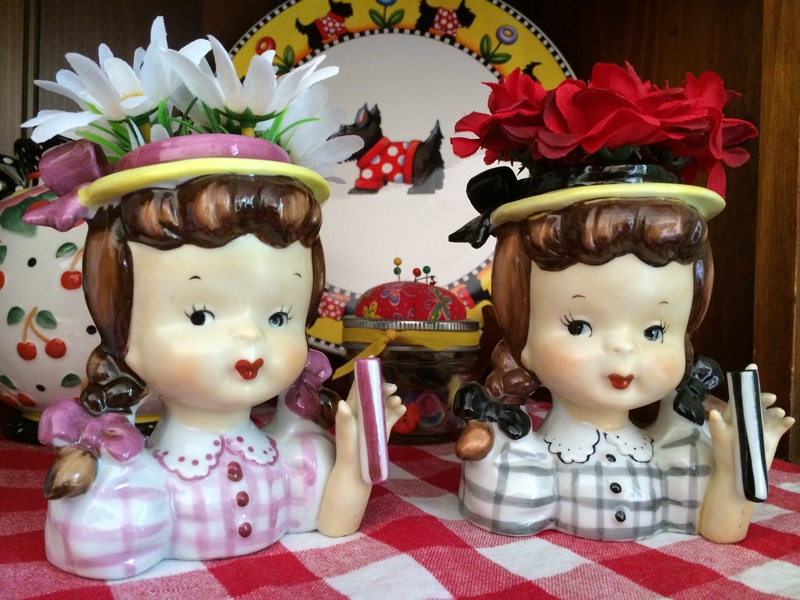 Yesterday, Linda found the “twin sister” to the little flower-vase figurine she purchased at Pleasanton two years ago. She hesitated to buy that first one until I told her to “go ahead and make an offer.” As I recall, she paid the same reasonable price for it as she did for her new twin yesterday. 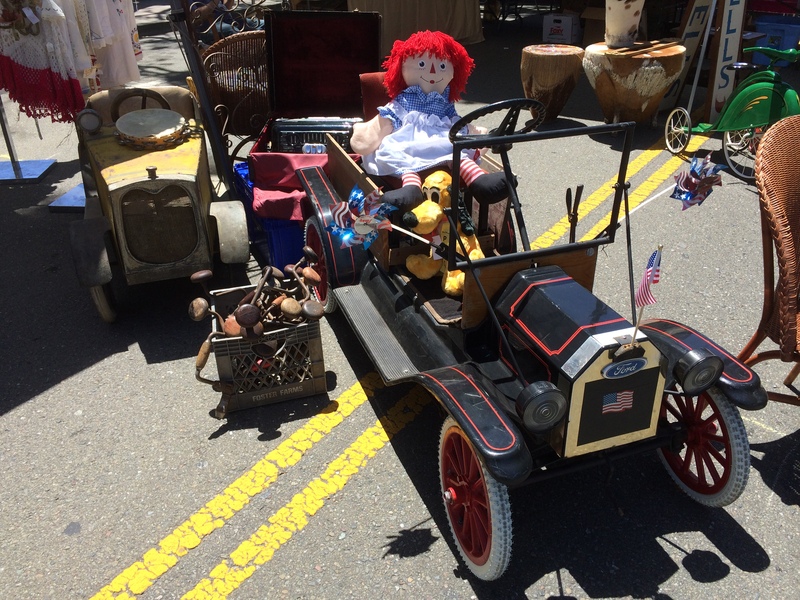 Linda was, once again, a happy camper yesterday as the seller carefully wrapped her treasure. My eye is attracted to anything that is important, interesting, or artistically pleasing. That encompasses a wide range! Price/affordability and my wife’s usual injunction, “Where are you going to keep it?” are two factors which weigh heavily on anything under consideration! Accordingly, paper items are great because they are inexpensive and require little space. I bought this, yesterday, for a few dollars not even knowing what it actually was until I paid the seller. 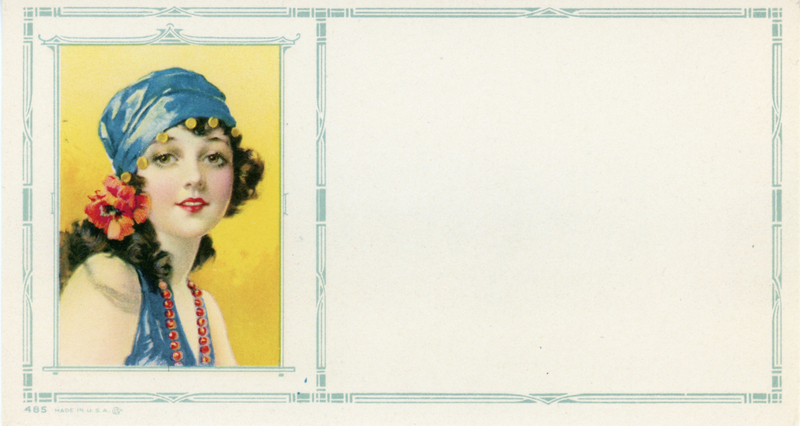 It is an antique blotter from the days when fountain pens ruled and ink dried slowly. I thought the artwork was fabulous. I found the following image two years ago, a wonderful reminder of early commercial aviation when the Douglas DC-3 ruled supreme in the late thirties and early forties. The only other purchase I made yesterday caught my eye standing on the sales table all by its lonesome. It speaks for itself; note the printing date of 1950 – one year after Russia surprised the world by detonating its first atomic bomb. Those of us well over sixty years of age can recall the cold war and the school drills in case of nuclear attack which required us to get under our desks and keep our heads down! That had always seemed such a simplistic measure in the face of such destructive power, but what else was there to do? I found it fascinating that the booklet asked, “What about super bombs?” While not denying their possibility, it cautioned, “Don’t be mislead by wild talk of super-super bombs.” The text went on to state, “Do not be mislead by loose talk of imaginary weapons a hundred or a thousand times as powerful [ as the 20,000 tons of TNT explosive equivalent yielded by the first atomic bombs].” Seemingly to discourage public despair, the thirty-one page booklet argues that the destructive power of such “imaginary” bombs would not necessarily be a hundred or a thousand times greater than that of the first atomic bombs. The aforementioned “imaginary weapons” of immense power were not long in becoming stark realities. 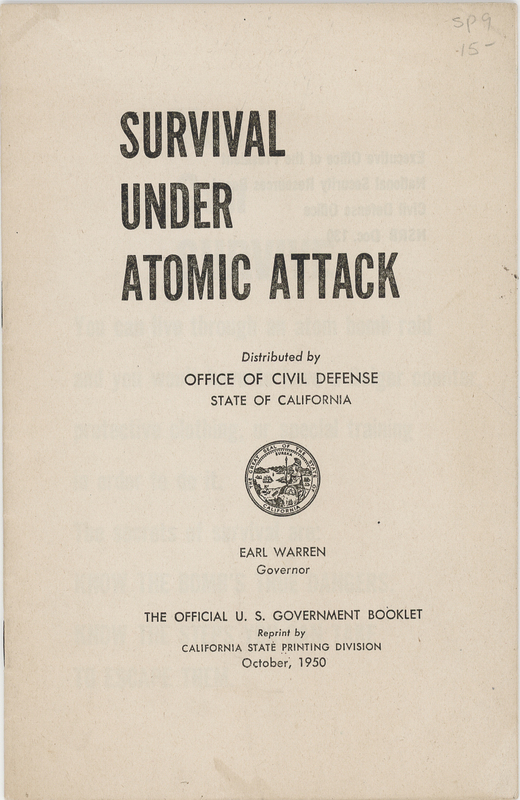 By 1950, when this U.S. Government booklet was reprinted by the State of California, Russia had just entered the atomic age and the first “super” or thermonuclear weapons were under development by the United States. 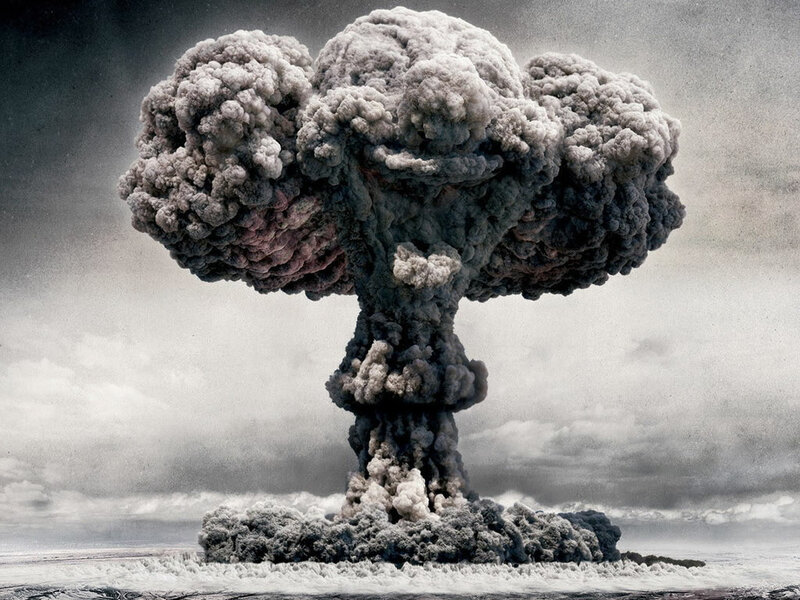 The first such bomb, popularly known as the hydrogen bomb, was detonated in 1952 by the U.S. The Russians detonated theirs a mere one year later, to the horror of many. When Linda and I vacationed in New Mexico a number of years ago, we visited Santa Fe and Los Alamos where the first atomic bomb was developed from 1941-1945. I recall standing amid displays of nuclear weapons showing their evolution through the decades since 1945. The exhibit which sticks in my mind to this day displayed the casing for a modern one megaton (one million tons of TNT equivalent) thermonuclear bomb, a weapon capable of vaporizing the heart of a large city like New York. What impressed me so: The (dummy) device, slightly raised from the floor and lying right next to my feet was missle-shaped – roughly, a mere 13 feet long and two-and-a-half feet in diameter – truly sobering. When I am thinking “big thoughts,” I often ponder what the future has in store for an increasingly nuclear world, one in which the deterrent effect of such weapons, which served to keep the peace during the cold war, may no longer be so effective. The pure atomic science which underlies nuclear energy along with the history of America’s Manhattan Project which birthed the bomb in 1945, and the geo-political ramifications of the nuclear age – these all combine to make fascinating reading and food for thought.